Bomberman's basic setup is very simple. After waiting through the 16 second animatic sequence, a menu pops up with only two options, one of which is for Single-Card Download play ("Battle"). Downloading takes place in a couple of different stages, the first session taking ~50 seconds and the second, just before the game begins, taking ~10 seconds. Most of the menus are easier to understand, especially the main menu. Fields are large and it's easy to tap what you want to tap. Most of the options make sense, not just in their location but also in their presentation. Some of the options even have descriptions on the upper screen. Unfortunately, there are a couple of odd design choices that can confuse players. When entering a handicap, after tapping "OK", you have to tap "Back" to return to the board selection screen, which could throw some people off. In addition, the handicap menu is located off of the board selection screen instead of the main options menu. Bomberman's play controls are simple: walk and bomb. Some items give you another button for for the purpose of their activation, but other than that, there' nothing else while you're still in the game. Once you're out of the game, if you've got Revenge on, then you get to use the touch screen to flick bombs at the living. The touch screen is otherwise relegated to the menus. In-game motions are precise with the direction pad, just make sure you don't get caught half on one square, half on another - the game won't automatically force you into the center of a square as you choose to step into it, so make sure your backside doesn't get burnt. Bomberman has a well-functioning blend of 3D elements on a 2D map. The look is solid for what they wanted to accomplish. It's not overly simplistic and it doesn't attempt to be too realistic, either. The music fits the mood of the game well, keeping things upbeat. There's also basic voice-over anouncing what you've just picked up (in case it wasn't an item that you recognized). If you know what all of the items are and would prefer to listen to your own music, turning off the DS's speakers probably won't affect the fun of the game. There are also plenty of options to choose from. With thirty (30) board to choose from (from a random board selector), four optional rules (Tiebreak, Revenge, Skull, and Slot), and the ability to select the number of sets, the time limit per set, and whether or not you begin at fixed or random locations on the board, you could spend hours upon hours just to try each combination once. If only the game took all of the mechanics that made each board unique and allowed them to be combined (as long as they don't contradict each other), it triple the number of options already presented. Despite how much fun I had with the game, there are still a few things I would've changed. First of all, when entering a handicap, you have to tap "OK" and then "Back", and tapping Back throws you off and makes you think that the handicap might not have been locked in. Second, instead of having thirty different boards where the boards are actually identical (except for Unipass, Tripass, and Mini-Mini) with different rules, why not have a dozen or so boards with different shapes/designs and have all the other options selectable from a menu. I would have loved to use voice-activated bombs on Barom, for example. I know that Bomberman Land Touch! is already out (and one of the built-in upgrades is Wi-Fi) and I am very much looking forward to picking it up and giving it a twirl! Fix the handicap confirmation process. Increase the number of board shapes/designs. Take all of the special rules associated with specific board and make them selectable on any board via a menu. 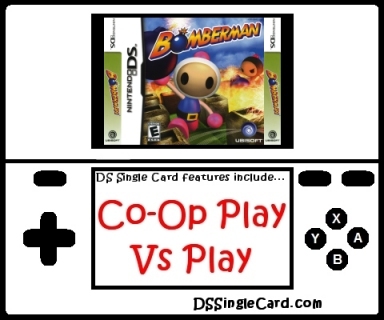 Click here to return to the DSSingleCard.com Bomberman profile.